Don’t panic, you won’t really be using an X-Acto knife! But in the “olden days” of analog multitrack tape recording you might have, because there were far fewer options for audio editing. You couldn’t record endless takes because of the limited number of available tracks, and punching sections in was far more difficult. As a result, many editing decisions were dictated by the limits of technology, and although not ideal, this tended to simplify things by forcing recordists to commit to decisions. These days, one can record a nearly unlimited number of tracks while making incredibly precise edits, all with unlimited “undo” capabilities. The downside is that it’s easy to record an overwhelming number of alternate takes and get bogged down in the minutiae of editing. Nervous artists may insist on recording (and keeping) far too many takes – sometimes atttempting to stitch together performances word–by–word. This can make the comping process a long and tedious affair. When this happens, it’s a good idea to put on your producer hat and (as tactfully as possible) put your foot down. Two or three full tracks to comp from is usually a reasonable compromise. Once you’ve decided on the source takes, we’ll further narrow things down by comping the source tracks down to a single performance. To do this, I’ll create a new blank audio track, then solo each track and A/B the performances one line at a time (Mixcraft’s loop mode is helpful for this). When I decide which line I like best, I’ll use Mixcraft’s split function to cut the section of the clip I like and drag it to my new “keeper” track. When deciding on which sections to use, I’m listening for conviction and emotion, pitch, and timing, in that order. Remember that minor pitch and timing issues can often be fixed with editing, but the quality and emotion of the performance cannot. Also keep in mind that a technically “perfect” take may not be the most inspiring performance. For a demo of exactly how to comp tracks in Mixcraft, have a look at the video beginning at the 2:27 mark. Once the vocal is comped together into a single continuous track, I’ll tune it. Whether to tune (and how much) really comes down to an aesthetic judgment call, dependent upon how well the singer stays on key, the type of music, and (on a case–by–case basis) how the performer feels about being “artificially” tuned. How Badly Does The Performance Need Tuning? – Obviously, the more off a performance, the more important tuning becomes. It’s a debatable topic, but in my opinion, the reality is that the more in–tune a performance is, the better. I like to joke that in the history of rock and roll recording, nobody ever stopped the tape following a take and said, “Do it again… you’re singing is far too on-key!” (This hypothetical can often stop a singer arguing the merits of a sub–par performance dead in their tracks.) On the other hand, if you critically listen to classic recordings of some acclaimed vocalists, you can often hear bum notes here and there, so don’t get too crazy. (As an example, Steve Perry of Journey is unquestionably a phenomenal vocalist, but if you critically listen to “Any Way You Want It,” you can hear him hitting slightly flat and sharp notes all over the place. )One other caveat: If you’re doing any kind of modern Top 40 or pop intended to sound like music you’d hear on the radio, tune it as close to perfection as humanly possible. It’s an immutable fact that all pop music is perfectly tuned these days, regardless of the performer’s ability. What Type of Music? – This one is probably self-explanatory. If you’re recording girl– group pop, for example, you’ll want super–tight vocal tuning. On the hand, if you’re doing death metal, or old-school punk, vocal tuning may be less critical. But there are no etched–in–stone rules: seminal punk rock band Bad Religion is known for their super–tight three–part vocal harmonies. Vocal Tuning Plug-Ins – If you’re using Mixcraft, you’ll already have the GSnap Pitch Correction plug-in included (if you’re not, go HERE and get it, because it’s great!). 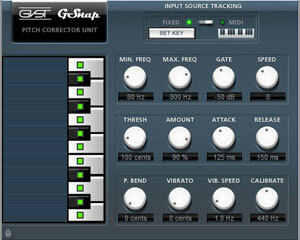 GSnap is easy to use and works great, so you may not need anything else. You could also use Antares AutoTune, the industry standard of vocal tuning, or if you really want to go nuts, Celemony Melodyne. Melodyne can be used as a plug-in, or as a standalone “mini-DAW” of sorts, letting you alter notes and timing much like Mixcraft’s MIDI piano roll editor, in addition to minutely editing vibrato, slides, formants, and more. For moving picture/talkie–riffic details on how to use the GSnap Pitch Correction plug–in, check out the video beginning at the 6:04 mark. Stay tuned to the Zeros & Ones blog – in our next installment, we’ll talk about how to add compression, EQ, effects, and volume automation for an awesome vocal mix. Odds are high you’ll get the best take of the session. Is there a part 4 tutorial about gsnap? There is a little company that does very good quality tuning by hand, and doesn’t want to bankrupt you like some other services out there. If you want pro quality results on a budget, they can be a good resource.